1 “Say of your brothers, ‘My people’, and of your sisters, ‘My loved one’. intended to cover her nakedness. no-one will take her out of my hands. her Sabbath days—all her appointed feasts. The setting sun (off to the left in this scene) is making the clouds orange, & the scene generally quite dark. Personification of Israel, as naked woman. The book of Hosea is all about Israel’s unfaithfulness to God, & what the Lord has to say about that, using the prophet Hosea. Chapter 2 is the beginning of the Lord’s assessment of Israel’s behaviour. I thought it might be good to show you this scene without the woman, or the Acacia branches in it, which shows more of the background scenery – see below. Hosea 02 – Restored via punishment – Scene 01 – Israel’s punishment – Landscape. Verse 1 really should belong to chapter 1, for some reason Bible translators (who inserted the verse numbers & sub-titles) included it in chapter 2! Additionally I have put the woman in a desert setting, & surrounded her with thorn bushes, as described in verse 6. I have drawn the woman hugging herself & looking up (towards God in heaven) horrified. I have deliberately positioned the woman’s hair & hands/arms to preserve modesty in this picture! I don’t want to shock or embarrass my viewers, but equally I wanted to illustrate the shocked look of “Israel” as she finds herself suddenly naked in the desert, surrounded by thorn bushes. A note about thorns & thorn bushes. The Holy Bible makes several references to thorns, briers, brambles, prickly plants, etc. Hosea 2:6 states that the Lord intends to block faithless Israel’s path with “thornbushes”. 6 But I’ll fix her: I’ll dump her in a field of thistles, then lose her in a dead-end alley. 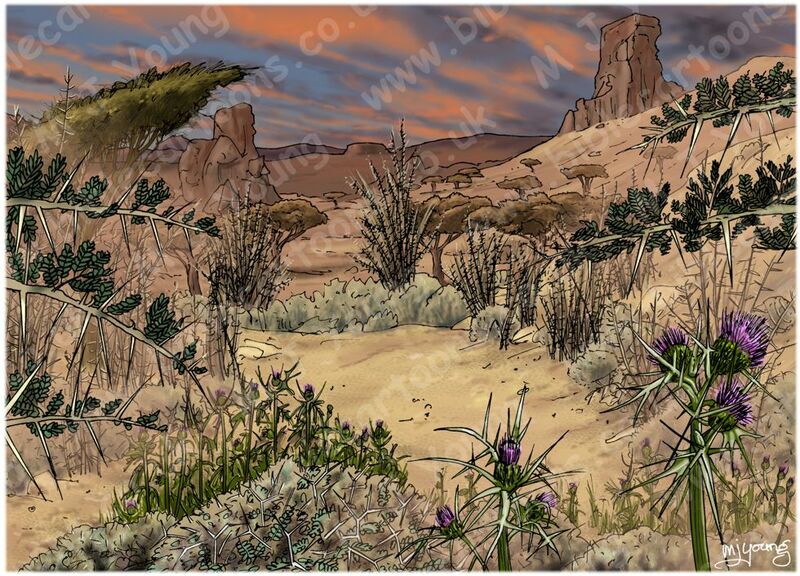 Based on these translations I decided to drawn spiny Syrian Thistles in the foreground, with thorny Acacia thorn bushes in the mid to background. Plants I have used in this scene. There is a close up of two of these thistles in the lower right foreground. The “maze” of thorny ground plants are Thorny burnet (Sarcopoterium spinosum, Poterium spinosum) aka Pricky Burnet, Brushwood) which grow to about 2 feet (0.6 metre) in height. Habitat includes Mediterranean Woodlands and Shrublands, Semi-steppe shrublands, Shrub-steppes, Deserts and extreme deserts, Montane vegetation of Mt. Hermon. There is a close up of one of these thorny bushes in the middle foreground. The taller bushes in the foreground, & all of the trees in the background are Umbrella Thorn Acacia (Vachellia tortilis, widely known as Acacia tortilis) aka umbrella thorn and Israeli babool)) which grow to about 13-23 feet (4-7 metres) in height. These spiny plants live in Semi-steppe shrublands, Shrub-steppes, Deserts and extreme desert habitats being thermophilous (heat-loving). The common name Umbrella Thorn Acacia comes from the umbrella shaped canopy the plant produces, usually from a single trunk. In extremely arid (waterless) conditions these plants only grow as bushes. There is a close up of the wickedly long spines & small leaves of this acacia in the middle right & left foreground of the scene. Other references to “thorns” in Hosea. The word for briers is qimmôwsh (kim-moshe’) & can also be translated “weeds”. The Hebrew word also carries the asense of “hook, ring, fetter”, something that binds & restrains a person. Here two Hebrew words are used, “qôwts” (or “kotse”) & “dardar”, which translate into “thorn, thornbush” & “thorn, thistle” respectively.